An FDA CLEARED, 3 minute wrinkle reducing and acne fighting LED device for your entire face. A combination of 100 lights in red mode + 62 lights in blue mode work together to smooth wrinkles, diminish discoloration, and clear acne for a beautiful, youthful complexion. Red lights penetrate deep within skin's dermis to stimulate collagen production. Blue lights destroy P. acnes bacteria to reduce redness, inflammation, and prevent future breakouts. Within days, see a reduction of acne. In 2 weeks, experience a clearing of mild to moderate acne and fading lines. 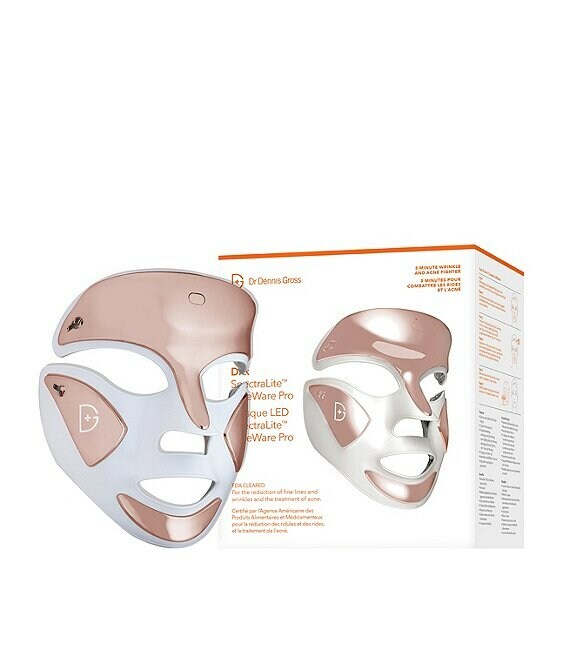 After cleansing and using a peel, place device comfortably over the face, securing strap around head. Press and hold power button for 2 seconds to turn on device, select light setting, and use for the programmed treatment time of 3 minutes. Device will automatically shut off. Remove device and follow with a serum and/or moisturizer of your choice.